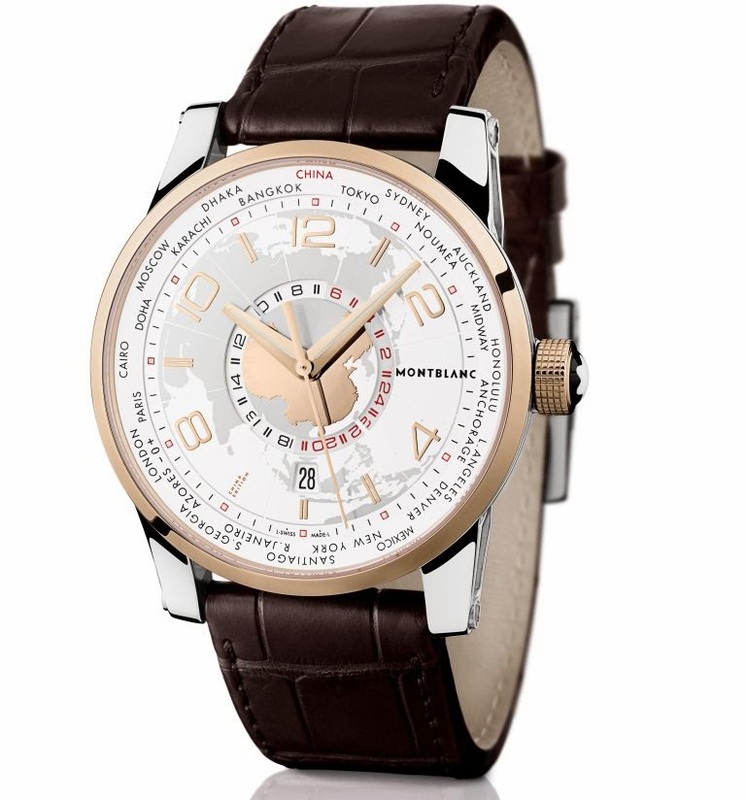 The Montblanc TimeWalker World-Time Sinosphere is based on the Hemisphere world-time watch, which was launched earlier this year, depicts all 24 time zones at a glance, and is available in two models – one for the Northern and one for the Southern Hemisphere. For the TimeWalker World-Time Sinosphere the Northern Hemisphere model – on which the names of places and cities in the Northern Hemisphere represent the world’s 24 time zones – was naturally chosen as basis. Exclusively on the World-Time Sinosphere, the UTC +8* time zone is not signified by Beijing or Hong Kong (as on most other world-time watches), but by the word “CHINA” clearly printed in red. The specialness of this new timepiece is also evident in the design of its dial, the centre of which is occupied by a gleaming red gold appliqué depicting a map of China surrounded by the pale grey contours of its neighbouring land masses. Rotating around the Middle Kingdom is the entire world, or rather the world-time ring with its 24-hour scale which, using red for nighttime hours and grey for daytime hours, shows the hour and the time of day or night in whichever zone is oppositely positioned along the dial’s periphery. A red gold plated sword-shaped hour-hand and minute-hand, each with luminous coating, sweep above this scene, as does a slim counterpoised second-hand. This trio shows the time in the wearer’s current zone by sweeping past Arabic numerals and indexes coated with red gold and applied along the dial’s periphery. To further express the exclusiveness of this special model, which is made in a limited series of 88 timepieces, the words “CHINA EDITION” appear in golden micro-print at “7 o’clock”. The dial is surrounded by a 42-mm bicolour case with a middle piece made of stainless steel and a bezel of 18 karat 5N red gold. Likewise made of 5N red gold, the finely fluted crown is inset with Montblanc’s emblem, which for decades has already adorned the writing instruments of countless heads of state. This watch is worn either on a brown alligator-leather strap with large reptilian scales and a stainless steel pin buckle or on a bicolour metal bracelet made of stainless steel with 18 karat red gold caps and secured by a triple-folding clasp. A sapphire crystal in the back reveals the winding rotor and the movement, which boast the quality characteristics of Swiss watchmaking tradition. Self-winding mechanical Calibre MB 4810/410 shows the hours, minutes and seconds in the selected local zone, as well as the times in all 24 of the globe’s time zones. The date appears in a window at “6 o’clock”, is coupled with the dial-train, and refers to the local time shown by the hands. After celebrating its world premiere at Watches & Wonders 2013 in Hong Kong, this model will be available starting in January 2014. With regard to the rules governing time zones, China is one of the most interesting nations and relies on a globally unique system. Russia, which extends 9,000 km from east to west, spans ten time zones (UTC +3* to UTC +12). The USA, which stretches 4,500 km from east to west, is divided into four time zones (UTC -5 to UTC -8). But despite the facts that China extends 4,200 km from its easternmost to its westernmost province and spans five different time zones, the whole country uses China Standard Time CST (UTC +8). This means that people who live in eastern China tend to rise too late in the morning and that their countrymen in western China must awaken several hours earlier than is customary – along with all the advantages and disadvantages when their clocks tell them to quit work each evening. Unified timekeeping is one factor that has contributed to the speedy and powerful upswing that China has undergone during the past thirty years. To enclose a huge territory and 1.3 billion residents in just one time zone also means that everything functions, and everyone works and communicates, in a unified time system. Attendance times are uniformly valid nationwide in offices and factories, as well as in agriculture and transportation. When someone phones from east to west in the morning, he always encounters open ears – even if day has long since dawned in the east and night still reigns in the west. With China Standard Time, this export-oriented economic power also offers its foreign trade partners a decisive advantage when they contact Chinese partners: a foreigner needs only to bear in mind the time difference between China and his location, and he needn’t consider any time differences within China. It’s a small but important part in the mosaic of China’s economic success. Universal Time Coordinated is the basis for officially valid time worldwide. UTC is measured from the prime meridian, which starts at the North Pole, passes through the observatory in Greenwich (England), and ends at the South Pole. UTC ±0 prevails throughout England. Time zones located to the east between Greenwich and the 180° meridian are designated as UTC +X, where X is the time difference in hours between Greenwich and each easterly zone. Zones situated to the west between Greenwich and the 180° meridian are similarly designated UTC -X. For example: Beijing is eight hours ahead of UTC ±0 and lies in the UTC +8 time zone; Los Angeles is seven hours behind UTC ±0 and is situated in the UTC -7 time zone. UTC is always the same and doesn’t distinguish between summer and winter time. Its passage is measured by caesium clocks, which err from perfect timekeeping by only one second every twenty million years. 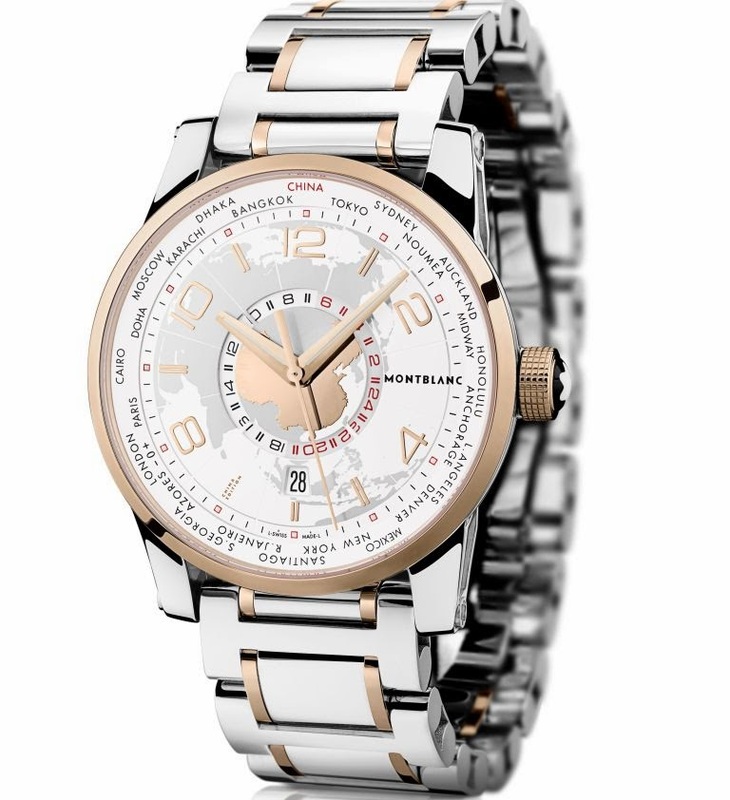 Introduced at Watches & Wonders 2013 in Hong Kong, the Montblanc TimeWalker World-Time Sinosphere time-zone watch is available in a limited edition of 88 timepieces.